Who isn’t familiar with it? Peeping through brokers’ shop-windows every year, taking the familiar booklets with you. It wasn’t any different in our case. However, starting a B&B in the South of France was an idea that would not go away. So we went to the Second Home Fair. 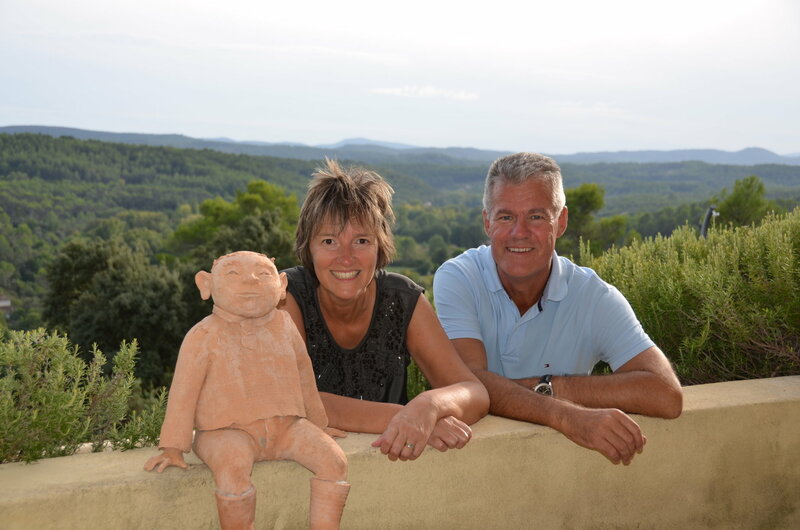 In the Provence we lost our hearts over the 10 years we visited B&Bs in France, Italy and Spain. Tere de Lumière was built in an old olive grove, consisting of restanques that have remained intact. With its modern style with a ‘Provençal flavour’ it blends perfectly into its surroundings. With a view “à couper le souffle”, the Provence is at your feet. The house was purposely built to become a B&B. With its spacious modern living room, generous guest rooms and perfect quality of construction, it was exactly what we were looking for! What we do even more? At the moment, we have a furniture business in addition to B&B Terre de Lumière, Kees Verhouden Meubelen in the village of Oirschot in North Brabant. A furniture showroom, a furniture-making shop and a paint shop. Kees holds sway here and we make customised furniture; in addition to our own label CASE we are also a dealer of a number of fine brands. Our activities in Oirschot and France can easily be combined: in France, the peak period is in the summer, in the Netherlands it is in the winter. To be well prepared before we started, we both obtained the catering diploma Social Hygiene, the Hygiene Code HACCP certificate and the Allergen Declaration.